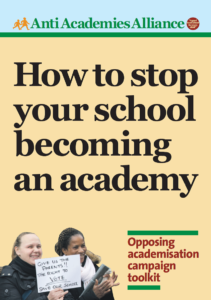 NUT members at Downhills school in Haringey are to strike on Tuesday 22nd May against their school being forced to become an academy. 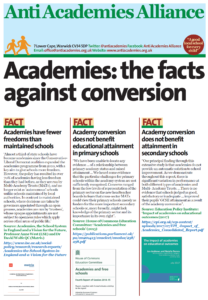 This entry was posted in News and tagged Forced academisation, Primary, Strikes. Bookmark the permalink. It’s great to know that there is a fight out there to save our childrens education and to stop this disgusting government taking away yet more of our rights. It’s also fantastic to see community and unions fighting together. You are showing us the way forward and sending waves of fear through those who like to dictate from above. Looking forward to joining you on the picket line tomorrow. What an inspiration. 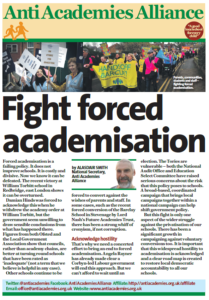 Your continuing fight against the attacks on your school and others by the forced academy’s policy of this govt. is a beacon to anyone who has any knowledge of the intentions of the Tory’s Do not be put off by the vested interests and the right wing press, your fight is justified and brave. I know it will get harder, and you may become disillusioned, but remain resolved, be strong and recognise that a great many good people support you in this fight to save our education system from being severely undermined, if not destroyed. My best wishes and support. Nb. Do you have a fighting fund?